Continuously cast superior cable in every sense. In many ways, the work of a critic is easy. We risk very little, yet enjoy a position over those who offer up their work and their selves to our judgment. We thrive on negative criticism, which is fun to write and to read. But the bitter truth we critics must face is that, in the grand scheme of things, the average piece of junk is probably more meaningful than our criticism designating it so. But there are times when a critic truly risks something, and that is in the discovery and defense of the new. The world is often unkind to new talent, new creations. The new needs friends. In last few months, I experienced something new, extra-ordinary interconnect and power cords and cables from a singularly unexpected and previously unknown source. To say that both the cords and the cables have challenged my preconceptions about fine cables is a gross understatement. They have rocked me to my core. In the past, I have made no secret of my disdain for expensive cords and cables. But I realize, only now do I truly understand what tweaking audiophiles mean when they say cords and cables can make a significant difference. Not everyone can become a great artist, but a great artist can come from anywhere. It is difficult to imagine more humble origins than those of the genius now designing at Clarus, who is, in this critic's opinion, nothing less than one of the finest designers in audio. I will be returning to Clarus soon, hungry for more. Like the critic above, cables, I said previously, are just ones and zeroes, so therefore Resistance, Impedance, Capacitance, Distance, Voltage, Connection and other electrical measurements of physical qualities could NOT possibly make a difference unless you paid too much for it! Right? Certainly not something as simple as Oxygen Free Copper (OFC) or Pure Copper Ohno Continuous Cast (PCOCC) could make a significant difference. Right? I explore both sides of this controversy with no less than Roger Russell, former Director of Acoustic Research at the famous McIntosh Laboratory, Igor Kuznetsoff of K Works Audio and Nelson Pass of Pass Labs and First Watt fame, among others, in an article of the same name. Yet, here I was in the other room, at my friend Phil Rastocny's home, for a tweaking audiophile club meeting (Meetup.com). Rastocny is a retired Bell Labs science writer. He has a heavily modified Bozak and Macintosh system in the living room. Rastocny is also author of the $2.99 "Extreme Audio" series on Amazon. As I recall, I was lollygagging at the snack table, round the corner in the kitchen, dipping some thinly sliced crudit�s into some savory white sauce. What I heard from the other room though made me stand up straight. Something had changed in Rastocny's system! I don't know what he did. I do remember thinking that the sound was greatly improved, even in the other room. I remember it being subtle, but nice, more organic, real and musical. I squeezed into a central position and listened some more. I liked what this strange company, this Claret or something company did with Rastocny's sound. I am not sure if the other two dozen middle age men crowding around the sweet spot totally agreed on every aspect. Yet every tweaking audiophile at this Meetup heard some improvements with the Clarus cables and cords. Although what they noticed and how they describe these differences varies widely. But then, my opinion does too. For I am a horns and tubes guy (see "Reviewers Bio"). My tweaking audiophile club now borders on a hundred members. Only a handful of us dare to have big, ugly horns squatting in our listening room. Yet at that moment, I wanted to take these Clarus cables and cords home to try out for myself. I had lots of questions. Oh, and I completely forgot about the crudit�s in the other room. In addition to questions about OFC, I found the Clarus line confusing too. The main company is Gordon J. Gow Technologies. Yet they also have a Tributaries line. The Clarus is their high end line. Gordon Gow died in June of 1989. President Joseph C. Perfito worked for McIntosh and directly for Gow from 1975 until 1990. In 1978, Gow married Perfito's sister, Pam. Perfito left McIntosh the year after Gow died and started Gordon J. Gow Technologies with his sister as a tribute to Gow. Perfito used the "Tributaries" name because he didn't like the sound of "Tribute Cables." A close friend suggested the name Tributaries. He thought that name was perfect for a wire and cable company. Clarus is located near me, in Orlando. Perfito came to Rastocny's for my local Suncoast Audio Society (Meetup.com), last year. He regaled us with an hour of industry stories. Sadly, he did not defame any living person directly by name. He was a true gentleman, darn it. I am such an outsider; I could drool over some juicy industry gossip. The high-end Clarus line was the result of brief comment made by John Atkinson of Stereophile magazine. Introduced to Perfito, Atkinson remarked, "Oh, Tributaries. Don't you make home theater cables?" Although Tributaries had some moderately expensive cables, Perfito says, "we were obviously not considered a high-end product." Not too long after that snippet, Perfito had a discussion with Jay Victor, who was assisting Clarus with getting their T100 and T200 power conditioner into production (review coming). "I am a musician, and life-long music fanatic," Victor said recently. His extreme interest in music resulted in attending hundreds of live concerts, including subscriptions at Carnegie Hall "before they ruined it." He believes live music must be the ultimate reference standard. "The main point of all of this," he says, "is that if you spend a lifetime listening to, and playing music, it is difficult to avoid developing a sensitive ear. Also, being a technically-minded person, and an Engineer, it is inevitable that Hi-Fi equipment would become a major preoccupation." Victor's audio life changed in the mid 1970's approximately. By chance, a co-worker introduced him to an older friend, Jerry, who happened to be an obsessed audiophile. Various listening sessions took place on the Jerry's "very ambitious for the day" system, which happened to be solid state, and they became good friends. This friendship led to an invitation for Victor to go to a Hi-Fi show in New York (the first one, as it turned out) which proved to be a real revelation for him on many levels, but there was one key moment that is burned forever into his mind. "In one room I happened to spot, of all things, a tube amplifier! In my mind, this was dead technology." "Tubes???" He uttered in disbelief. My friend Jerry responded in a totally noncommittal, neutral and unbiased tone, almost as an aside, "some people think that tubes sound better." This to me, was like a bolt of lightning, and struck a chord so deep, that I instinctively knew that this had the unmistakable ring of truth. Eventually, when finances permitted, I took the plunge and acquired a set of "modern-day" tube amps, and the results were a revelation, compared to the typical solid-state gear of the time. With this system, Victor said, "the magic was back! The lesson learned was that something that may not necessarily have known measurable differences or advantages, be it solid-state or tube, could sound more like real music, and you should trust your ears. Newer technology isn't necessarily better, although it can be. Nothing should be assumed or taken for granted, and this is how I approach my design work. " "I take chances, try different or unusual things, measure, and then listen, above all." Victor said. "You can't always base things on existing formulas or conventions, and you sometimes need to start from scratch. In my case, as a cable designer, I started by listening to individual conductor gauges and materials. Every wire gauge sounds different! Then different dielectric materials and methods sound different! Then different combinations of wire gauges sounded different; and on and on. Since there are almost unlimited combinations possible, this is very tedious and time consuming, but only by this means can you really optimize the designs and be sure you have the best possible combination. This is how my cables are designed." Victor's engineering career began designing X-Ray cables and wire harnesses, proprietary connector design and scientific test instrument design. One of the employers made calibration systems for missile guidance systems, so Victor did rocket science stuff! After that, Victor spent 12 years of intensive engineering working as a Mechanical Design Engineer in large Engineering departments alongside and working together with Electrical Engineering counterparts, who, as it turned out, were often audiophiles, and this led to many unauthorized "side projects", and also a very good electronics education on-the-job. Victor then worked at Monster Cable Products as New Products Development Manager. Over the course of approximately five years, Victor was instrumental in developing hundreds of audio products. In 2002, Victor founded Orbital Development. Victor is now the holder of approximately 50 patents for cable geometry and connector design. Working both independently and with strategic partners, he developed countless cable and Audio/Video products for many high profile customers in the field: PS Audio, Belkin, Ethereal Home Theater, StreetWires, Esoteric Audio, Phoenix Gold, Fender, Vox, Savant, Tributaries, Horizon/Rapco, Core One, Clarus, Ultralink, XLO and other well-known brands. The emphasis, Victor says, "is always on providing best possible value for the money, and best possible performance in relation to the sound of live music." Back to Clarus. Victor advised Perfito that he held multiple patents in high-end cable design. Victor described patents that Perfito thought were fascinating. Clarus was born and introduced to the world at the Rocky Mountain Audiofest in October 2011. Perfito decided to name the high-end product line Clarus, so that it was separated philosophically from Tributaries, like Toyota and Lexus. Victor designs the Claus line. He is the patent holder of the technology used in Clarus Cables. Applying this technology, Victor designed the conductor shapes, sizes, quantities, insulators, shielding and winding process. Clarus' internal design team designed the cosmetics. Victor also designed the Tributaries Series 6 and Series 8 analog, digital audio, USB, power and speaker cables. 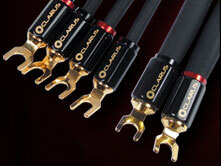 The Clarus line has CNC-machined gold-plated connectors; individually insulated cable strands; precision impedances and hand craftsmanship. The Crimson cords are made with precision-formulated polyethylene (PE) insulation. The cords are PCOCC (see this month's OFC article). Clarus recommends a long burn in before starting evaluation, at least 72, preferably 96-120 hours. My demo models were already used. These are thick, cloth-covered ribbons, threaded with a weave or red, much thicker even than my Coincident CST1- rattlesnakes, which I use on my Klipschorn bass bin. They are also relatively stiff, twisting the short fingers is necessary to get the cables onto the binding posts. They are certainly no problem for the finger-size posts on monster amplifiers like Pass Labs. The cables look and sound like a serious investment in quality and capability. The spades were large on some amplifier posts. I inserted a business card between them to keep the spades from touching each other. First: My squawker and tweeter cables, gray $25 Belkin four-wire, shielded star-crossed copper strands with no connectors . Second: White and gold CablesForLess.com 12-AWG OFC with no connectors, $15 for 50'. Third: Red Home Depot 14-AWG copper with no connectors ($15 for 50'). Fourth: my bass bin cables, thick black $495 Coincident CST 1 rattlesnakes with spades. Immediately the difference I heard in Rastocny's kitchen stood out. "Freedom Overspill" by Steve Winwood ("Back in the High Life") sounds like his hit of the same name. There was obvious smoother treble. The Crimson cable had no harshness. The drum whacks were more tangible, adding to their realism. The Crimson cream easily rose to the top of the cable milk. It was far more listenable. Though subtle, still ones on a scale of ten, the improvements were felt across the board. Musical peaks didn't sound LOUD, an indication of distortion and clipping. Ringing cymbals had metallic sizzle. "Pearl on the Half Shell" by Weather Report ("Sportin' Life," named after a character from Porgy and Bess) is a percussive-popcorn, smooth jazz tune. Josef Zawinul jabs at the keyboards. On other cables, the jabs sound like beeps. With the Crimson, the beeps sound like an instrument. "Pearl" had more impact, improved dynamics with better separation. What could be an annoying jumble of mess sounds like individual instruments. More than the others, I felt the bass tinkle my toes. I noticed maracas that I didn't hear before. I heard shouting on the track for the first time. There was excellent separation, leading to better definition, of the instruments. Loud volumes were easier to handle. On Grover Washington Jr.'s "Poacher Man" (Soulful Strut) the song was more involving. The female voices of the spoken lyrics sounded fuller, more like women than young girls. Unlike the other cables, there was no childish edge to the back-up singers at all! The Crimson cable added dimensionality to the jungle sounds. On other amplifiers, it was as if we had moved up to the Sonic Craft amplifiers. The cable was always a smidgen better in all respects. These subtle differences aren't always noticeable at low volumes, but stood outright when pushed loud. As the system cranked out the dBs, the quality of the cables made significant differences. Many components sound perfectly fine on typical passages. It is difficult passages, at very loud and complex extremes, when pushed hard, grabbing the air, against the yoke, charging onto higher, tougher ground, that superlative equipment makes a difference. Live music should be played loud. Sip the wine. Knock one back. Inhale and hold. Crank it up. Enjoy the music. When tested in battle, solders win medals. In the crowded, sophisticated passages at LOUD volumes, General Crimson stood out proudly amongst the drab green-gray of the rank n' file cables. For that reason, I test components at loud volume with a full symphony orchestra playing a crescendo. No other music has such simultaneously wide frequency response, huge dynamic range, high volume musical peaks with as many as 100 different types of string, brass, woodwind, and percussion instruments, all playing at the same time. Take Richard Wagner's classic "The Ride of the Valkyries," for example. The Crimson may seem magical in many respects, but it could not make a poor recording sound as if it was real. It easily handled crescendos without harshness, but there is no substitute for live, unamplified acoustic music in a dedicated, "jewel box style" music concert hall. By the end of numerous swapping and changing music and amplifiers and loudspeakers and swapping and changing again, I wanted to sit and enjoy the music with only the Crimson. They became my Catha edulis. My chew of choice. My khat. I didn't want another drug. Superior in every pure sense, continuously cast Clarus Bi-wire Crimson loudspeaker cables help you enjoy the music. With many cables, I had to close my eyes in order to focus and listen to the music. The Crimson made me want to close my eyes while I enjoy the music. Although other cables came close in some respects, most notably the slinky black, woven DanaCable Onyx by Gingko Audio*, the Crimson were always the easiest to listen to. In this small sample, in general, the more wire and the larger the post connectors, the better the cable sounded. The heavier and stiffer Crimson always displayed more details and texture without any annoying distractions. How close does the slinky Onyx weave come? Certainly, 80% of the Clarus capabilities... for 11% of the price! Maybe more. The Onyx cables are indeed the better value. The Crimson cables are indeed the deliciously better sound. Looking for cost-no-object cable for your $64,000 or $640,000 system? While I have not heard many other uber-expensive cables, I can certainly recommend Clarus Crimson cables as the best I've heard. On the Enjoy the Music.com scale, I award four Blue Notes in every category! Where the other cables sounded quite similar, width and depth of soundstage for example, the Crimson always sounded a tad better; their soundstage was wider and deeper. Only because I have not auditioned other mega-buck cables against them, do I withhold five Blue Notes as "the very best regardless of price" (see Our Reviewing Standards). Send me some wonderful cables boys, while I still have these red snakes in hand, and we will run this race again. In many ways, the work of an audio critic is easy. The Crimson series were always the best cables I have heard against all others on every home theater music and movie reproduction system on which I heard them. So expect me to give them an Enjoy the Music.com award in the upcoming award issue. Will indeed be returning to Clarus Audio cables soon, as am hungry for more. Individual Bi-wire Cables sold singly. For pairs double each price. Gordon J. Gow Technologies, Inc.